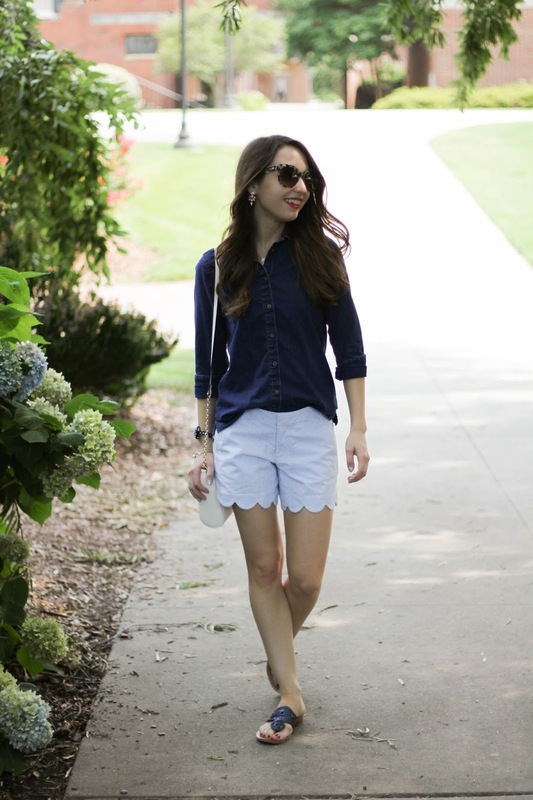 I'm bringing a very simple look to the blog today with these seersucker scallop shorts. My mom happened to find these Lilly Pulitzer shorts at TJ Maxx for only $24! Considering that I have come close to paying the full price of $64 several different times over the last few summers, I think it was a really great find. The seersucker version is no longer available, but there are a variety of different prints and solid colors of the same style in stores now. I love just about anything with scallops, so these are a great way to change up my casual looks that I usually wear with solid chino shorts. I love how simple and cute this look is!! You always find great TJ Maxx deals! I love shopping there! Love these shorts! I have been on a seersucker kick lately and I love anything with scallops!